It's always easy to tell the time on a Rolex Explorer thanks to its tidy dial. The stainless steel Oyster case and the Twinlock crown protect this watch from the elements and make the Explorer the perfect outdoor watch. A Rolex Oyster Perpetual accompanied Sir Edmund Hillary and Tenzing Norgay as they ascended Mt. Everest in 1953, resulting in the release of the Rolex Explorer soon thereafter. Since then, the Explorer has remained largely unchanged and has been praised by watch enthusiasts for its robustness, reliability, and neat design. A single glance at its characteristic black dial has always been enough to tell the time. This is due to the large numerals at 3, 6, and 9 o'clock as well as the large, glow-in-the-dark hour markers. The 12 o'clock marker is a prominent upside down triangle. The Explorer's stainless steel case features the proven Oyster design. Prior to 2010, it was always 36 mm in diameter. Every Explorer since has been three millimeters larger, starting with the reference number 214270. Regardless of the size, these watches are usually worn with a stainless steel Oyster bracelet, though you can find pre-owned models with a leather or textile strap. 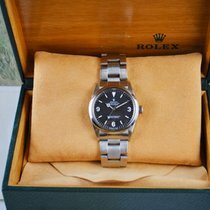 How much is a Rolex Explorer? Prices for Explorers largely depend on the model's year of production and condition. Early models, such as the ref. 6610 and its successor, the ref. 1016, are particularly coveted among collectors. The former was equipped with the caliber 1030 and was water resistant to 50 m (5 bar, 164 ft). Plan to spend about 12,100 USD for a pre-owned ref. 6610 in good condition. The ref. 1016, which debuted in 1963 and was produced until 1989, is hard to distinguish from its older sister model. Nevertheless, there are some minor differences: It was first powered by the caliber 1560 and later by the 1570, was water resistant to 100 m (10 bar, 328 ft) , and used tritium instead of radium as its luminous material. Prices for this timepiece range from 14,600 USD for a pre-owned model to 19,500 USD for an unworn example. Sapphire glass was first introduced to the Explorer line with the ref. 14270 in 1989. Rolex simultaneously rolled out their COSC-certified chronometer caliber 3000, refreshing the design of the dial. The three numerals now had a more modern style and were applied in the same manner as the indices. Prices for pre-owned models start around 4,900 USD, while never-worn examples sell for about 7,100 USD. In 2001, Rolex brought the ref. 114270 to market, which was the last Explorer with a 36-mm diameter to date. This model also received some major changes to its interior, including the use of caliber 3130. On the outside, the watch remained largely unchanged except for its bracelet's massive end links and Fliplock clasp. It also featured a different luminous material: Superluminova. A never-worn model demands prices around 7,600 USD, while pre-owned models can be found for as little as 5,200 USD. The Explorer with the reference number 214270 was first introduced in 2010. The main difference between it and previous models was its size: Its case is 39 mm in diameter, which is three millimeters larger than any previous Explorer. What's more, Rolex outfitted this watch with the caliber 3132, which includes the Paraflex shock protection system and a blue Parachrom hairspring. 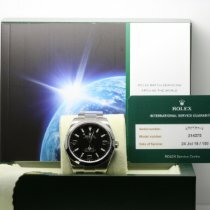 Rolex also switched from SuperLuminova to Chromalight for the luminous material. While the indices and hands had always had a glow-in-the-dark coating, the numerals 3, 6, and 9 first got this treatment in 2016. Furthermore, Rolex extended the length of the hands, which is most obvious on the minute hand. Expect to pay around 6,500 USD for a new Explorer ref. 214270 and 5,700 USD for a pre-owned model. One characteristic of the early Explorer that remains the same to this day is the large Arabic numerals at 3, 6, and 9 o'clock. The rest of the hour markers are line indices, except for the upside down triangle at 12 o'clock. The bright white of the indices and numerals makes for a stark contrast against the black dial. It's easy to tell the time right away with one look at the dial. The hands, numerals, and indices contain the luminous material Chromalight, making it possible to read the watch easily even in the dark. Rolex is unique in their use of Chromalight, which glows blue, as most manufacturers use Superluminova, which glows green. Rolex used tritium until the late 1990s and Superluminova from 2000 to 2008, when they replaced it with Chromalight. The Explorer has only undergone a few changes over the years. A notable change occurred in 2010, when the case size was increased from 36 to 39 mm. The case is made of 904L stainless steel, a material which has proven itself especially scratch and corrosion resistant. Water can't do much damage to this watch either, thanks to its screw-down case back and Twinlock crown with a double sealed system. The Twinlock crown can be found on every model in the Oyster collection. Thanks to this crown, you can take the watch swimming and snorkeling, as it's waterproof to 100 m (10 bar, 328 ft). In 1989, Rolex modified the dial, shape of the case, and indices. These watches, with reference number 14270, still have the smaller case size of 36 mm. The indices are made of 18-karat white gold to prevent tarnishing. Before this change, the Swiss manufacturer had produced the Explorer under the reference number 1016 for a quarter century. 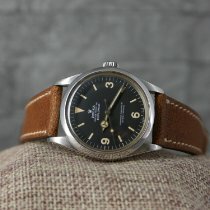 If you're searching for a vintage Explorer, a 1016 model is a good choice. Furthermore, this Explorer is the most authentic James Bond watch of all: Bond author Ian Fleming owned an Explorer with the reference number 1016. Although the hero has worn various watch brands in films – from Rolex to Seiko to Omega – he's always worn an Explorer in the novels. In the 1963 novel On Her Majesty's Secret Service, Fleming describes how Bond reads the large, luminescent dial numbers on a black watch from the Oyster Perpetual family. The description fits Fleming's Explorer perfectly. The new Rolex Explorers produced after 2010 bear the reference number 214270. They're easy to spot due to their larger cases, which house the in-house caliber 3132. According to Rolex, the movement deviates from the reference time by a maximum of two seconds a day. This easily surpasses the requirements set forth by the Official Swiss Chronometer Testing Institute (COSC), which has issued this movement a passing certificate. The movement's balance spring is made of Parachrom, a special alloy, which is unaffected by magnetic fields . The Rolex Milgaussoffers even more protection against magnetic fields, as its movement is protected by a shield made of ferromagnetic alloys. The designs of the Milgauss and the Explorer resemble one another, but the Milgauss is also available with a white or blue dial. Additionally, the Milgauss is slightly larger with a case diameter of 40 mm. The Paraflex shock protection system developed by Rolex protects the caliber 3132 against impacts and jolts. This automatic movement ticks at 28,800 alternations per hour and has a 48-hour power reserve.